If you own or operate a restaurant, you know that grease trap maintenance is a must for sanitary, health and safety reasons. Regular grease trap maintenance and pumping can prevent costly down time and grease trap replacement. 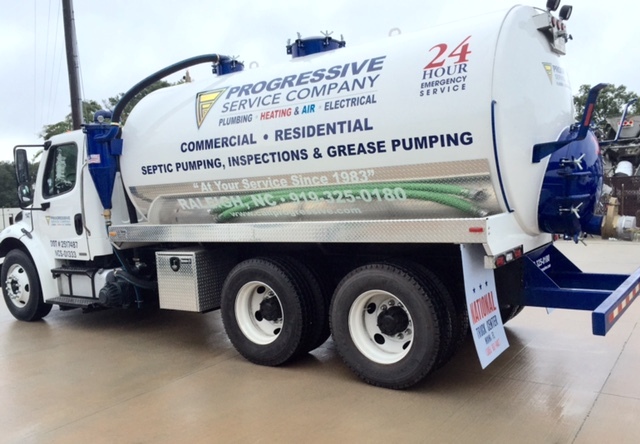 The professionals at Progressive Service Company are experts in cleaning, maintaining and pumping grease traps. Our Raleigh-Durham grease trap technicians thoroughly clean and maintain the entire grease trap, and pump it with the help of our state-of-the-art pumping trucks and eliminate waste at a licensed processing facility. Using highly advanced technology and equipment, we ensure your continuous operation and offer service contracts for grease trap maintenance, repair and pumping. As your partners in plumbing maintenance, we are available for emergency grease trap pumping or repairs 24 hours a day, 7 days a week. Plus, our work is backed by a 100% satisfaction guarantee. Whether you manage one or many restaurant or other commercial locations, you can rely on Progressive Service Company for prompt, dependable grease trap service, pumping and repair. Call us any time, day or night to speak to a Raleigh-Durham commercial plumbing specialist. There’s no need to worry over faulty or broken grease traps – Progressive has your back with 24/7 emergency grease trap service. Progressive Service Company is proud to provide grease trap pumping, repairs and service to commercial customers in Raleigh, Durham, Chapel Hill, Apex, Cary, Morrisville, Burlington, Carrboro, Wake Forest and the surrounding areas.